To own or ride a super fast motorcycle may be one of your dreams. The question is if you have enough money in your pocket, which motorcycle you would buy? The fastest one. Right? Here is the list of 11 fastest motorcycles in the world. 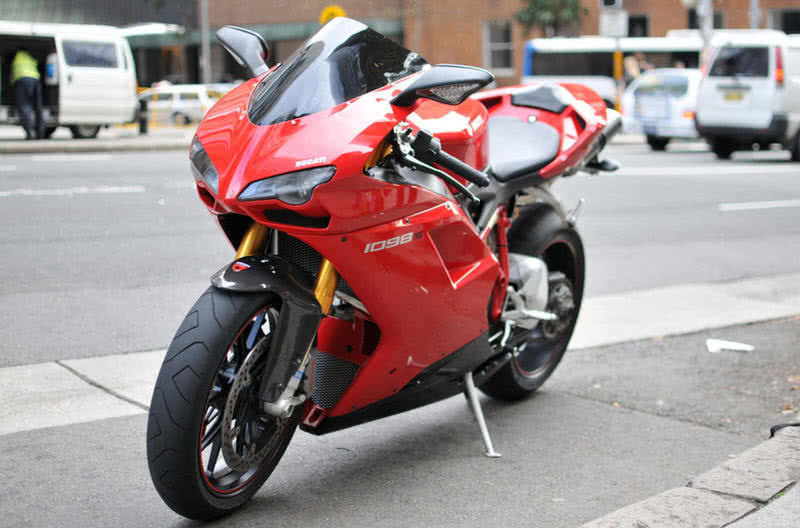 Ducati 1098S is one of the fastest and most selling superbikes in the world. The 1099 CC engine with 160 HP helps to attain a maximum speed of 169 miles per hour, with the highest torque to weight ratio. Ducati 1098S features many racing components and weight saving technologies, which makes up a complete speed machine. It is the lightest and fastest motorcycle from Ducati with an efficient suspension. 1099 CC liquid cooled L-Twin cylinder engine. 6-speed transmission and multiple dry clutches with hydraulic transmission. Maximum power: 160 HP@9750 rpm. Maximum torque: 123 Nm@8000 rpm. Top speed: 169 miles per hour. 0 to 100 km/h: 3.2 seconds. Front brakes: 2*330 mm discs four-piston calipers. BMW K 1200S is a hyper-sports touring motorcycle from BMW. This motorcycle features 1157 CC, 16 valves four-cylinder engine, which generates power of 164 HP @ 10250 rpm. 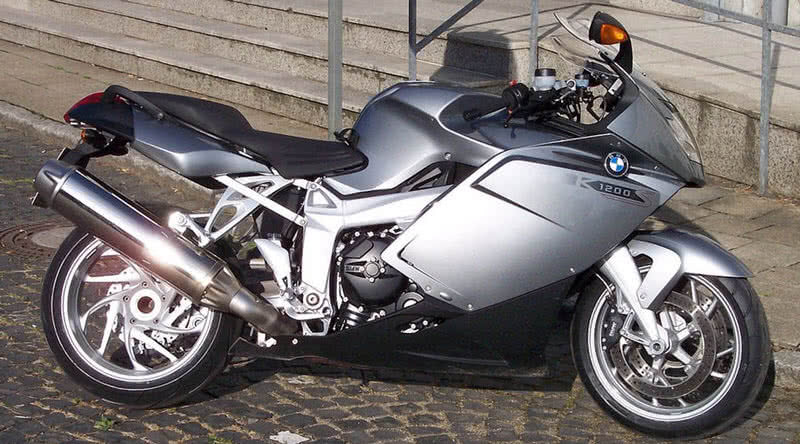 BMW K 1200s can reach a maximum speed of 174 miles per hour. This powerful motorcycle also has revolutionary suspensions and efficient brakes for stopping safely from blazing speed. Just like the cars from BMW, this super bike also features eye-catching design. 1157 CC DOHC, 16 valves four-cylinder engine. Maximum power : 164 HP @ 10250 rpm. Maximum torque: 129 Nm@8250 rpm. Top speed: 174 miles per hour. 0-100 km/h : 3 seconds. Front brakes: 2*320mm disc with four-piston calipers. Rear brakes: single 265mm disc with two-piston caliper. 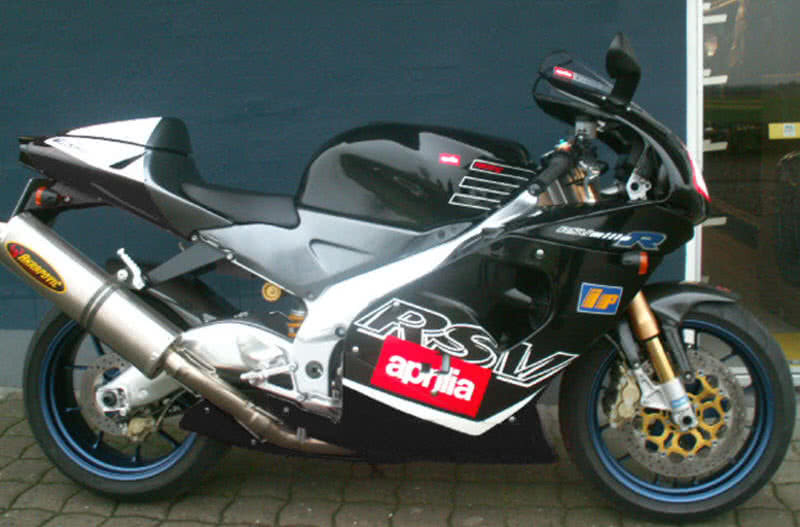 Aprilia RSV 1000R Mille is the fastest superbike from Aprilia company. This motorcycle has a 998 CC V-twin engine, produce 141.13 hp @ 10000 rpm. RSV 1000R Mille can cross 0 to 140 km/h in just 10 seconds. The top speed of Aprilia RSV 1000R Mille is 175 miles per hour. This motorcycle also has a stunning design and best quality seat. 998 CC four stroke 60 degrees, V-Twin engine. Maximum power: 141.13 HP@10000 rpm. Maximum torque: 107 Nm@5500 rpm. Top speed : 175 miles per hour. 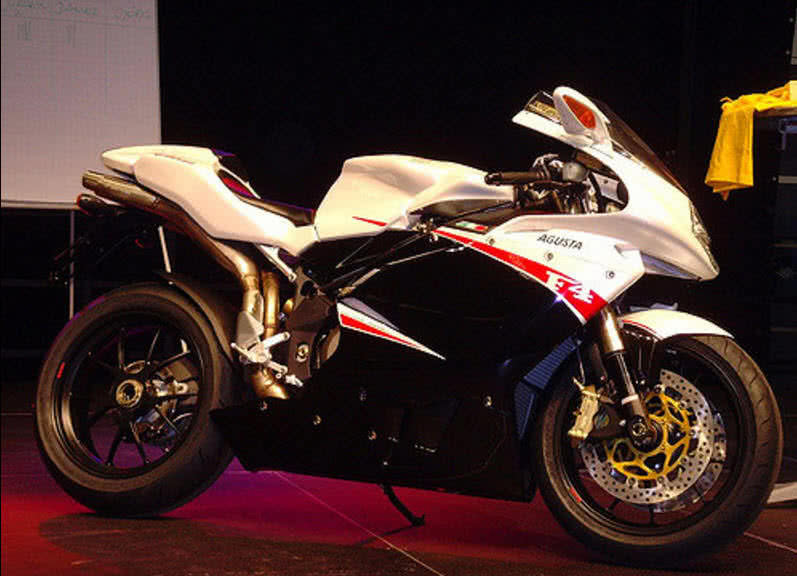 MV Augusta F4 1000 R is the second series of F4 1000 motorcycle from Italian manufacturer Agusta. It is a limited edition superbike from the company. This super bike has 1000 CC, 16 radical valves liquid cooled engine. This motorcycle can produce a maximum power of 174 HP and max torque of 115 Nm @10000 rpm. MV Augusta F4 1000 R can reach 0-100 km/h in 3.1 seconds, and its top speed is 184 miles per hour. 1000 CC, four cylinders 16 radical valves, DOHC liquid-cooled engine. Top speed: 184 miles per hour. Front brakes: Dual 320mm disc with four pistons radial caliper. Rear brakes: Single 220 mm disc with 2 piston radical caliper. 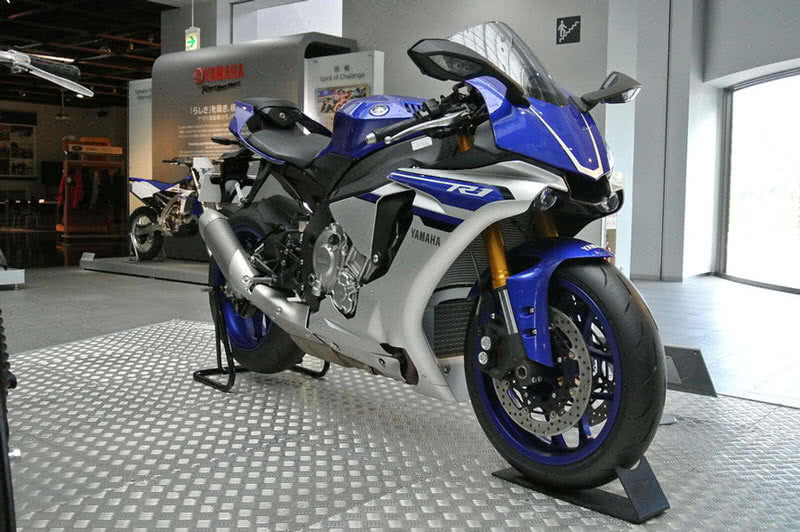 YZF R1 is the most impressive motorcycle from Japanese manufacturer Yamaha. The first motorcycle from famous R1 series came out in 1998. Now, 2019 edition Yamaha R1 officially unveiled. The new 2017 YZF R1 features 998 CC, liquid-cooled, 16-valve, DOHC, in-line-four-cylinder, engine. It produces a maximum power of 200 @13500 rpm. The top speed of new Yamaha YZF R1 recorded at 186 miles per hour. Maximum power: 200 HP@13500 rpm. Maximum torque: 112.4 Nm@11500 rpm. Top speed: 186 miles per hour. Standard traction control, quick launcher, and advanced ABS. Front Brakes: 320 mm, four-piston caliper hydraulic dual discs. Rear Brakes : 220 mm hydraulic single disc. Honda CBR1100XX is the fastest sports tourer motorcycle from Honda till now. This series manufactured between 1996 and 2007. 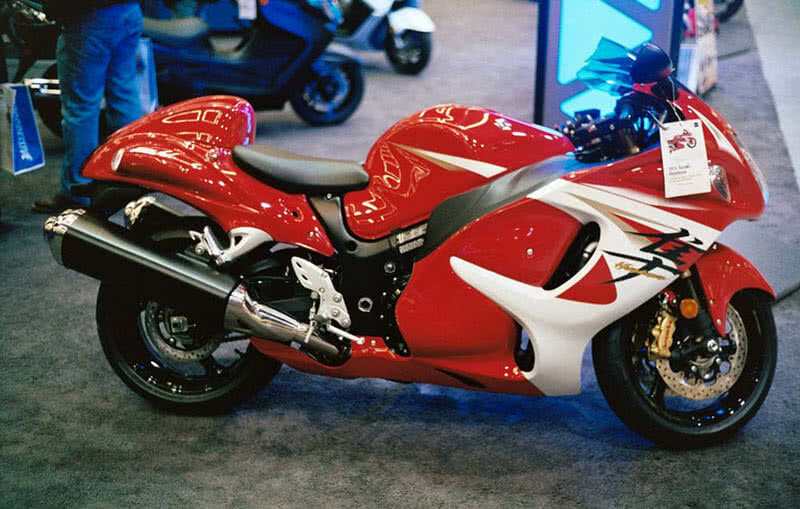 In 1997, Honda CBR1100XX held the title of the fastest production motorcycle by defeating the legendary Kawasaki ZX-11. CBR1100XX can hit a top speed of 190 miles per hour with a powerful 152 hp,1137 CC engine. The dual counter balancer shaft provides exceptional smoothness for this superbike. Maximum Torque: 119 Nm@7250 rpm. Top speed: 190 miles per hour. Front brakes: 310 dual discs with three-piston calipers. Rear Brakes : 256 mm single dics with 3 piston caliper. Hayabusa is named after the Japanese name of Peregrine Falcon, the fastest bird in the world which flies at a speed of 203 mph. 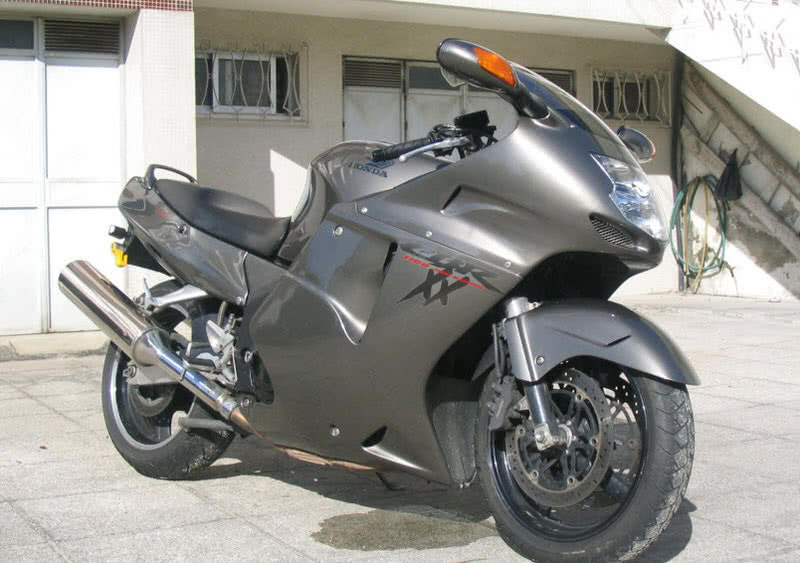 At a top speed of 194 miles per hour, the Suzuki Hayabusa could even reach close to Peregrine falcon. Hayabusa is the fastest superbike from Suzuki. This ultimate superbike features a 1340 CC four-cylinder 16 valves, liquid cooled engine that produce the power of 197HP@6750 rpm. 1340 CC, four-stroke, DOHC, 4-cylinder 16 valves engine. Maximum power: 197 HP@9500 rpm. Maximum Torque: 155 Nm@7200 rpm. Top speed: 194 miles per hour. 0 to 60 mph: 2.5 seconds. Front Brakes: 2*310 mm discs, Brembo, monobloc radial-mount calipers. At the top speed of 208.1 mph, Kawasaki Ninja ZX-14R is the second fastest production motorcycle till date. This super machine could cross 0 to 100 km/h in just 2.7 seconds. 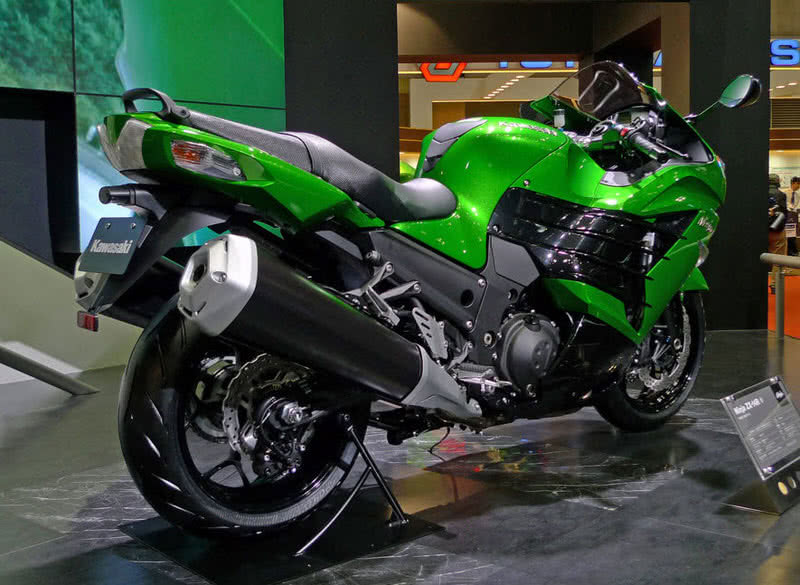 Ninja ZX-14R features a 1441 CC four valve liquid cooled engine. Kawasaki Ninja ZX-14R can produce a maximum power of 197.3 Bhp@ 10,000 rpm. For a decade, superbikes from Ninja series hold the first position among the list of fastest motorcycles in the world. 6-speed transmission and wet multi-disc clutch. Maximum torque: 158.2 Nm@7500 rpm. Top speed: 208.1 miles per hour. 0 to 100 km/h: 2.7 seconds. 0 to 200 km/h: 7.2 seconds. Front brakes: 2*310 petal discs, four-piston calipers. MTT Turbine Superbike is a non-production motorcycle from Marine Turbine Technologies which is recognized as ‘the most powerful production motorcycle’ by Guinness book of world records. To be specific, Turbine Superbike Y2K is a wheel-driven motorcycle with a turboshaft engine that manufactured between 2000 and 2005. This motorcycle has been designed to extract the heat energy from the exhaust and convert it into output power. It features Rolls-Royce 250-C18 turboshaft engine that produces a maximum power of 320 HP @ 52000 rpm. 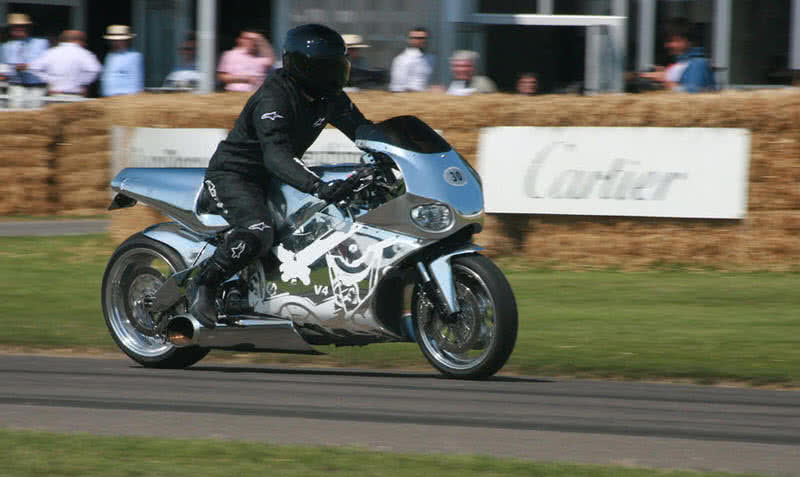 The top speed of Y2K superbike has been recorded at 227 miles per hour. Maximum power: 320 HP@52000 rpm. Top speed: 227 miles per hour. Front Brakes: 2*320 mm discs with four-piston Brembo calipers. Rear Brakes : Single 320 mm disc with 4 piston caliper. The hyper sports Kawasaki Ninja H2R is the fastest production superbike till date. It’s a track only motorcycle. At whopping 300 H.P, the supercharged Ninja H2R can hit over 249 miles per hour. This unbelievably powerful machine features 998 CC supercharged DOHC inline-4 engine. 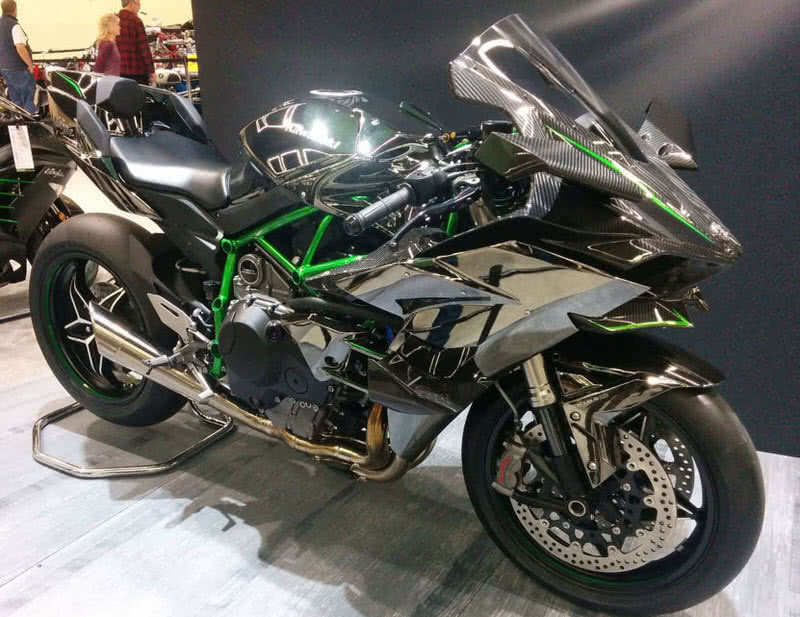 Kawasaki also uses a trellis frame for the first time on Ninja H2R. It provides strength and better control of this motorcycle. Inspired by MotoGP and F1 racers, Kawasaki also includes dog-ring transmission which provides fast and smooth shifting. Top speed: Over 249 miles per hour. Front Brakes: 2*330 mm, dual-semi floating, radial mount discs with four-piston calipers. At the top speed of 420 mph, the Dodge Tomahawk is the world’s fastest motorcycle ever produced. Dodge unveiled this ultimate superbike in 2003. According to the reports, only 9 of this motorcycle has been sold yet. 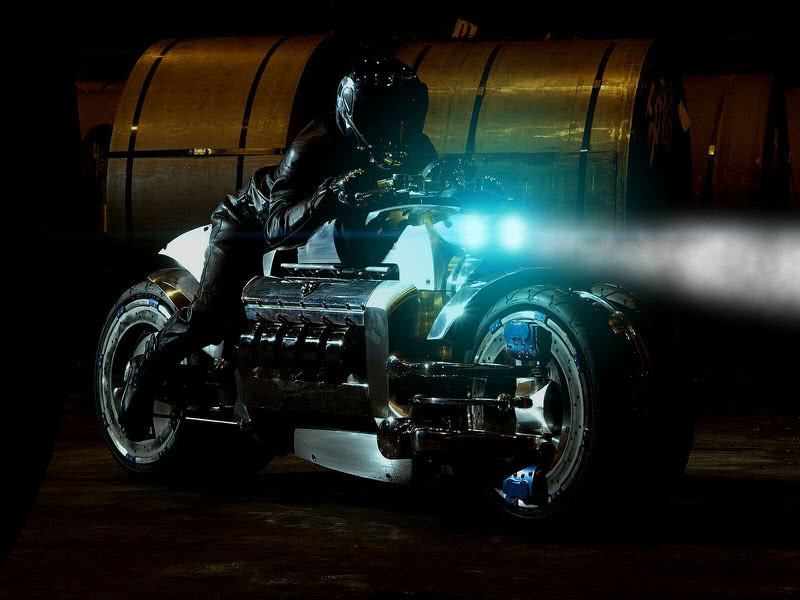 Dodge Tomahawk features 8.3 liters, V-10 SRT 10 Dodge Viper engine. 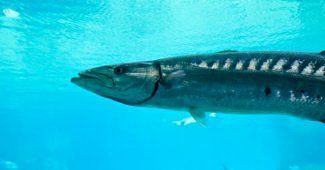 It can produce a maximum power of 500 HP. Unlike other superbikes, Dodge Tomahawk has four wheels – two front wheels and two rear wheels. Surprisingly, Tomahawk could cross 0 to 60 mile in just 1.5 seconds. Maximum power: 500 hp@5600 rpm. Maximum Torque: 712 Nm@4200 rpm. Top speed: 420 miles per hour. 0 to 60 miles: 2.5 seconds. Rear brakes: Dual 508 mm 16 piston discs. Front brakes: single 508 mm 8 piston discs.